Today, I have a quick lesson to share with you. A public service announcement if you will. Never, I repeat, never make a pan of Rice Krispie Treats while dieting. Somehow you will find their light, crispy, marshmallow gooey-ness, calling out to you. And you, being a fairly normal, Rice Krispie Treat loving fool, will not be able to ignore their siren call. No matter how rooted in your willpower you think you are or how far you have lumbered along on that darn treadmill over the past few days. You will find yourself eating a whole row right out of the 13 X 9 inch pan (and I'm talking the 13 inch side, not the 9 inch one!) You will find yourself full of remorse for even having bought those darn Rice Krispies and marshmallows to begin with! 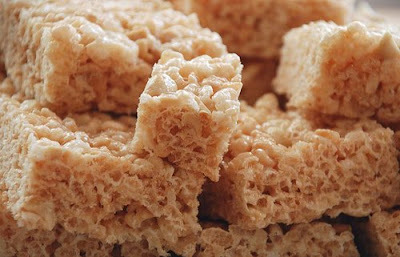 So, heed my advice, listen to the experienced among you, and do NOT make those Rice Krispie Treats while dieting. :-D You made me giggle! Your so funny Gina, but I totally understand...I probably wouldn't be able to resist such a gooey and delicious treat. But remember what I've told you...just get right back on the horse (the diet horse) :-)Have a wonderful weekend my friend...Oh, by the way, love, love, love how your living room turned out and loving that new wall color. Enjoy. LOL! You are too funny. I have totally been on that 13" side of that pan and it ain't pretty.